Talib Hussain, the unsung hero, who intercepted yesterday’s suicide bomber of Brewery Road was inadvertently quoted in an earlier press release of this Organisation as a Hazara tribesman which has now been confirmed to be an honest and sincere watchman of non-Hazara ethnicity performing his duty in Railway Housing Society at the time of the attack. This further corroborates the fact that religious extremism and terrorism in Balochistan is imported from elsewhere to keep people under continual threat while the civil society still showcase the will to curb such a menace by whatever means possible. The sacrifice of Talib Hussain should not underestimated nor should it be taken at face value as he was the only breadwinner of his entire family. He has set an inextinguishable example for international community that Pakistanis, in general, are against terrorism lest unendorsed individual or small group-scale acts. As Talib Hussain laid his life to protect the lives and happiness of other citizens, it is now moral and religious responsibility of everyone to fund-raise for his family so that they are not forgotten on this auspicious occasion of Eid. 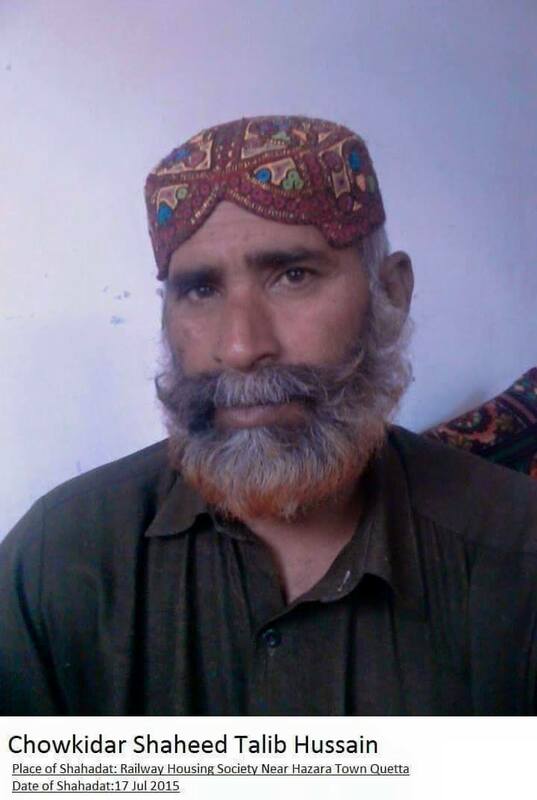 In the meanwhile, HUM has decided to take up the issue with the Government of Pakistan for posthumous award-conferment (Sitara-e-Shujaat) and monetary compensation to his family on this invaluable sacrifice. Posted in Pakistan, Press and Information and tagged Brewery Suicide Bombing, Talib Hussain. Bookmark the permalink. While people were busy in preparations and celebrations of Eid festivities on Chaand Raat in Eastern and Western parts of Quetta city after the official moon sighting was confirmed throughout Pakistan, a burka-clad suicide bomber attempted to enter the densely populated area of Hazara Town. Talib Hussain Hazara, the alert security official at the entry/exit point on Brewery Road braved to thwart the attack by stopping the suicide bomber who instantly blew himself up. 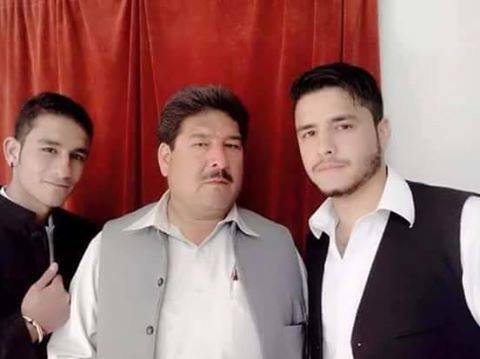 The failed attempt took the lives of two innocent people including Talib Hussain Hazara who sacrificed his life to prevent the loss of hundreds of other lives. HUM demands from the Government of Pakistan to confer Talib Hussain Hazara Sitara-e-Shujaat (Star of Bravery) as well as endorsing monetary compensation to the heirs of the martyr. Posted in Pakistan and tagged Brewery Road Suicide Attach, Failed Suicide Attack on Hazara Town, Talib Hussain Hazara. Bookmark the permalink. 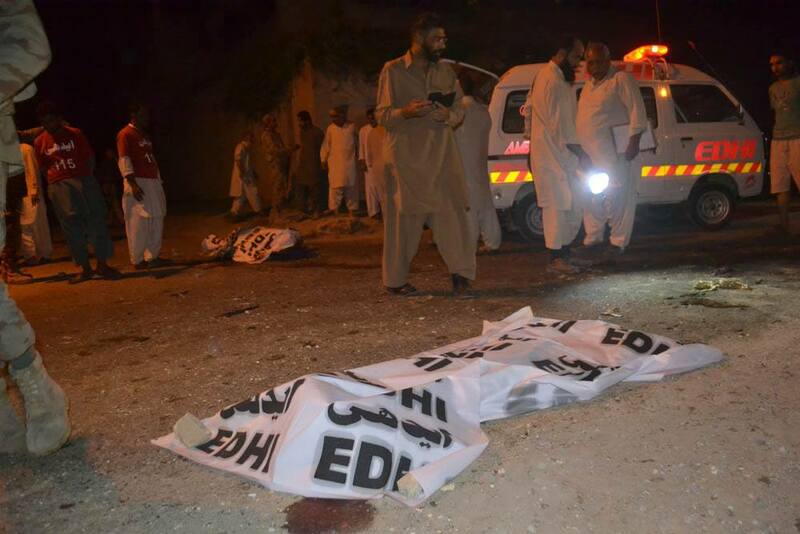 Quetta city witnessed the cold-blooded murder of three innocent people today outside yet another bustling and crowded Government Department when “unknown” motorcycle riders target-killed them in a broad day light. Two brothers Hasan Raza and Shabbir Hussain lost their lives on the spot while their parents have sustained critical bullet injuries who are fighting for their lives in a local hospital. Reportedly, a policeman on duty succumbed to his injuries who dared firing on the target-killers and receiving retaliatory shots. After the incident, the CCPO, Capital Police promptly claimed to have identified the killers but hundreds of such previous attacks still try to determine as to how the perpetrators remain unpunished in the last 16 years provided the proven agility and efficiency of law enforcement agencies in knowing the killers. In a separate incident yesterday, over 20 innocent shoppers including women became injured owing to a bomb blast in the heart of the city centre which also took the lives of two people. Prior to that on 1 July, three people lost their lives as a result of a targeted attack on a shop on Sirki Road who were quietly buried the same day in Hazara Graveyard Alamdar Road. The Pakistan’s Federal Government as well as the Balochistan’s Provincial Government have hurriedly issued rote condemnation statements blaming foreign hands behind the previous two incidents while today’s incident is likely to attract the same level of government’s attention. However, given the threshold of complicity exhibited by the Pakistani Government towards these perpetual killings, it is transpired that she has granted clean-chits to the religious extremists and terrorists to exercise the title of “the unknown” at discretion. Posted in Pakistan, Shia and tagged Joint Road, Sirki Road. Bookmark the permalink.